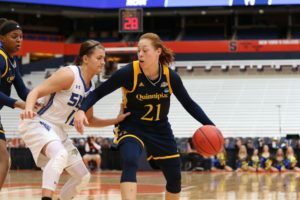 The Quinnipiac women’s basketball team is hanging up its dancing shoes as it lost in the NCAA Round of 64 to South Dakota State University at the Carrier Dome in Syracuse, New York on Saturday by a final score of 76-65. The Bobcats (26-7) trailed by 11 at the half, 41-30, but were able to battle back and win the third quarter. They out-scored the Jackrabbits (27-6) 21-17 to cut the deficit to 58-51. The Bobcats came in sporting the best turnover margin among the 64 teams in the NCAA Tournament. 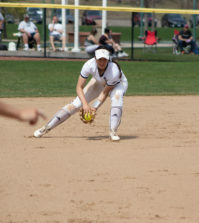 In addition, the team was second in steals, third in turnovers forced and in the top-10 in field-goal defense. Redshirt senior forward Jen Fay led the way for the Bobcats, tallying 25 points on 10-of-18 shooting with nine rebounds before fouling out with 45 seconds left in the fourth quarter. 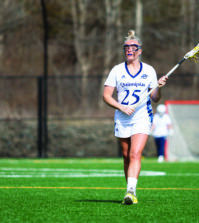 Fay’s 25 points matched her total from the Metro Atlantic Athletic Conference (MAAC) championship game. Foul trouble contributed to the Bobcats falling short as prior to Fay fouling out, senior forward Aryn McClure (11 points, five rebounds) fouled out with 4:01 left in the fourth. By the end of the game, even senior forward Paula Strautmane was in danger of fouling out with four fouls. The trio were the Bobcats’ leading scorers and rebounders throughout the season. 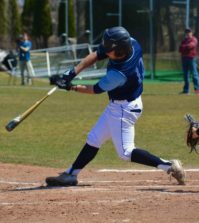 Despite Fay and McClure’s performances, the Bobcats as a whole had a difficult day from the field. The team shot 35.4 percent and only 25 percent from deep. This included shooting just 3-of-13 in the second quarter and 6-of-22 in the fourth. Despite forcing the Jackrabbits into 14 turnovers, the Bobcats couldn’t capitalize on these turnovers, only scoring 12 points. Redshirt senior guard Macy Miller led the way for the Jackrabbits with a double-double (28 points and 11 rebounds). Miller’s 28 points led all scorers. The Jackrabbits ended up winning the battle on the glass 49 to 34. 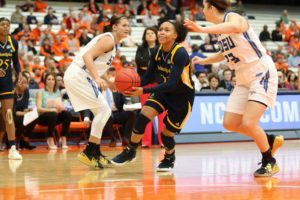 The loss marks the end of an era for the Bobcats, whose senior class helped lead them to three straight MAAC championship wins and the program’s first three wins in NCAA Tournament history. Aside from Fay, McClure and Strautmane, the senior class includes guards Edel Thornton and Brittany Martin. With just under 30 seconds left, the Bobcats’ remaining seniors checked out of the game to applause from the fans, band and cheerleaders who made the trek to support them. While the end of an era of dominance courtesy of the senior class and an exit from the “Big Dance” came sooner than they’d have liked, it’s apparent that this is where the Bobcats expect to be for years to come.